If you're a regular reader of this blog, you're probably aware that I'm a sucker for sitars. I don't think I've quite let readers on to my obsession with the sounds of the vibraphone (I've got a shrine to Roy Ayers in the closet of my mind), but we've got a fine album here to scratch that itch. Mike Mainieri may not be on the A-list of jazz vibraphonists, but he definitely manages to work out some great grooves on this LP. Helping out immensely is flautist Jeremy Steig. His contributions should erase that image of Will Ferrell rocking the jazz flute in Anchorman. This will be in regular rotation on the sound system when I open my chain of opium dens. 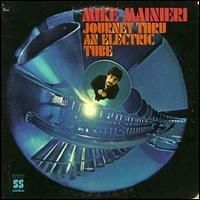 On Journey Thru an Electric Tube, we've got several groovers and ballads. All of the groovers are top notch - "It's All Becoming So Clear Now" and "We'll Speak Above the Roar" glide through time and space quite well, with the rhythm section providing a nice platform for Mainieri, Steig, and some fuzz guitar to train off from. "The Bush" makes me thing of early Allman Brothers if you're up for that sort of thing. I'm not quite as hep to the ballads here, but they are perfectly listenable. "I'll Sing You Softly of My Life" fares the best of those tune. But for all of you psychonauts out there, we have the extended "Allow Your Mind to Wander" for your discerning ear. This track has some wild improvisation, strange echoing effects, and is firmly planted in the more avant guard realm of existence. You'll be best of following the instruction of the track's title. Once you've played out your Cosmic Brotherhood from Bill Plummer, this is a nice destination for your fix of psychedelic jazz. Several of the tracks here have the ability to launch your mind straight through a psychedelic basement club at 3am (well, that's where the electric tube took me), and the rest are perfectly listenable affairs. A superb LP.I found it a few weeks ago at hippydjkit blog and it is reaally great. A good article.Vendant les chaussures sport, notre objectif est d’établir un réseau complet fournissant des sports chaussures pas chères. Nous avons établi une bonne relation coopérative à long terme avec des sources de fabricants et avec des agents des sports chaussures, de plus, toutes les marchandises ont la garantie de qualité et de crédibilité, donc vous êtes rassuré de les acheter et les utiliser, nous n’épargnerons aucun effort pour vous donner notre services parfaits. OMG.....I have this on vinyl somewhere, and had forgotten about it. Thanks! I'm a huge sucker for vibes and sitar as well. I would have no problem if you revealed that interest more. Haha. Thank you for this. Great stuff as usual! Thank you for all the fine records I can discover here in this blog!!!! !